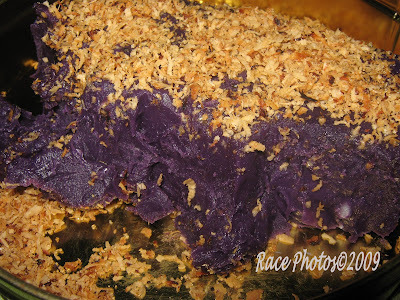 This yummy looking rice cake is actually a combination of maja, ube and rice cooked together to get this kind of Ube Maja. My cousin cooked this one in Laguna for my Mom's birthday, it's one of her experiments :-) it tastes good and different from the usual rice cakes that we have here in Cainta. Of course it tastes even better with the toppings on the top. Happy Food Friday to all, enjoy your weekend! See other yummy food here! saraap! naalala ko tuloy yung dolor's sapin-sapin. I love maja, yellow or white. This is new to me. Your cousin's experiment looks yummy! gusto ko nyan! i also like the yellow one, maja blanca naman yata yun. kakaiba nga parang hindi pa ako nakatikim ng ganito. but it does look so yummy!